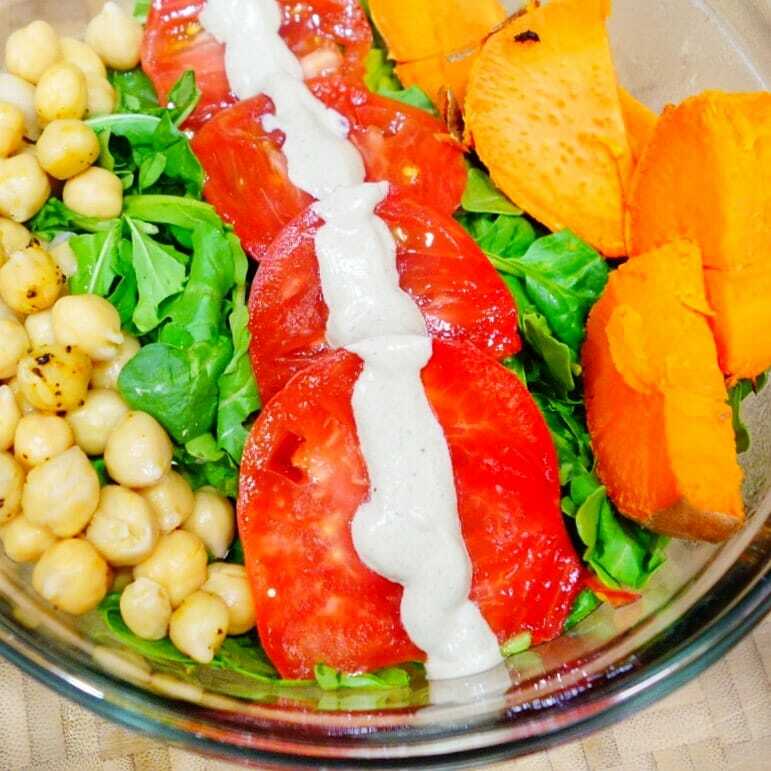 This Warm Caesar Sweet Potato Salad Bowl is a perfect meal for the fall and winter months. 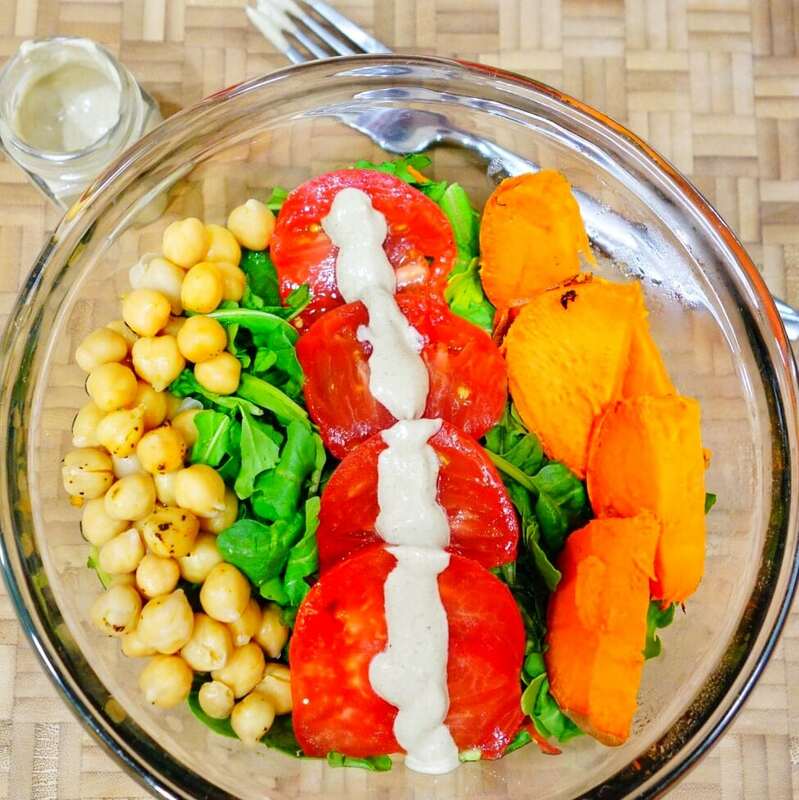 Salad-like bowls are a great way to keep your salads interesting and fun. You can tailor this bowl with any veggies you’d like, but adding cooked veggies will help warm things up. I like to make bowls with cooked veggies because then you can choose when you have a bite of them. Tossed bowls are good too. The real star of this recipe though, is this Caesar dressing, which is dairy-free and oil-free. 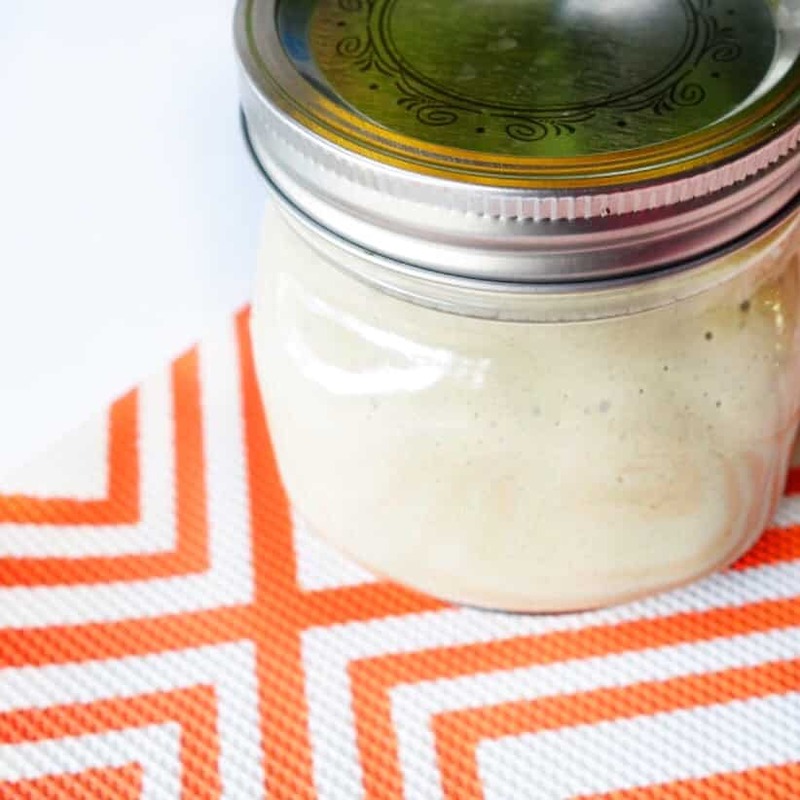 There are many healthier, dairy-free Caesar dressings out there, but most still contain a lot of oil. With this recipe, you receive good fats from the cashews so I prefer to leave the oil out… It does NOT tamper the flavor either. It has so much flavor and creaminess. Once you have the ingredients out, this takes less than five minutes to make in a high speed blender. Be sure to store it in a glass jar in the fridge and eat on it all week! It’s not just good on salads, but also as a sauce on this burger! This bowl consists of garbanzo beans, artichoke, peppers, tomato and baked sweet potato. After snapping these lovely shots, I thin tossed it with more of the Caesar dressing. It’s pretty simple to throw all of this together too. 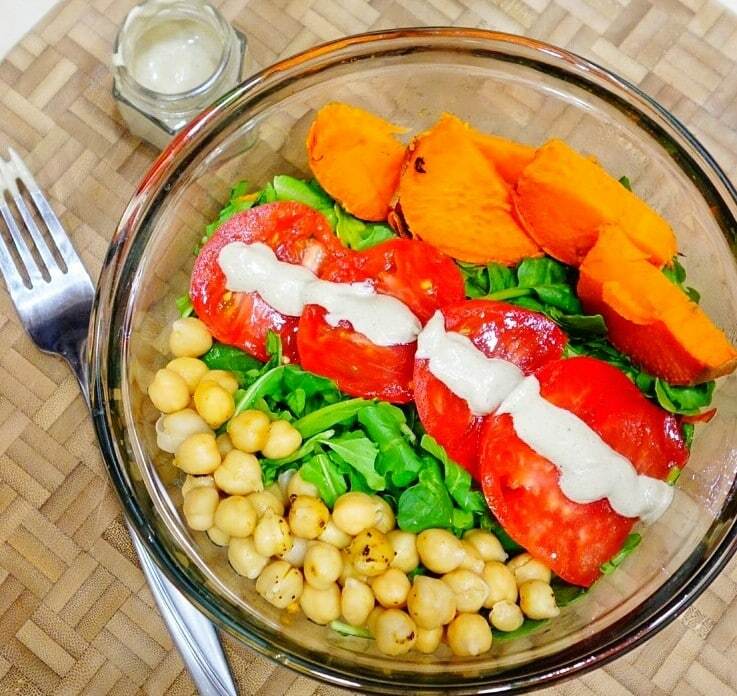 Start baking your sweet potato, then make the dressing, assemble salad and eat. I bake my sweet potato at 400 for about 45-1 hour depending on the size. Depending on your oven’s power you might need 350 or 425. Keep an eye out on it and fork check it. You can eat this with any greens and veggie you’d like, but I also found it extra tasty when I topped it with capers for a bit more saltness. What’s your favorite bowl combination? TIP: When making the dressing, if you’re using the seaweed sheets – start with half a sheet. Taste and then add more. Same goes with the garlic. Start with 4 and add more if you prefer. Throw all the ingredients in the blender and blend until smooth and creamy.... It's that simple! Be sure to taste with a piece of lettuce or other veggie. Adjust seasonings to your liking. TIP: If you're using the seaweed sheets - start with half a sheet. Taste and then add more. Same goes with the garlic. Start with 4 and add more if you prefer. I like a lot of garlic so I used 6. Store in the fridge for 5-7 days. 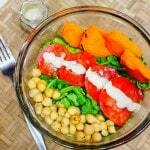 I love warm salads, especially when they involved sweet potato! Can’t wait to make this! I love all the different ingredients in this! So many great flavors! This bowl would brighten anyones day! Love the flavors and colors!